Ninja job application poster sent out by Nagoya’s tourism board. In early March, Aichi prefecture put out a call for applicants to a job many maybe considered impossible to attain: full-time, salaried, ninja. The internet exploded, much to the surprise of the organisers, as overseas applications flooded in. Moving quickly, their Facebook page quickly became bilingual, and they, and their chosen recruits started taking interviews with the world’s big media outlets: AFP, BBC, and Discovery Channel. Along with six, young Japanese trainee ninjas, they hired American world-traveller, and martial arts expert Chris O’Neill, and began training for the debut on May 5th, with less than a month for team-building and choreography. With the pressure of expectations, and so little time, it was always going to be a challenging task. 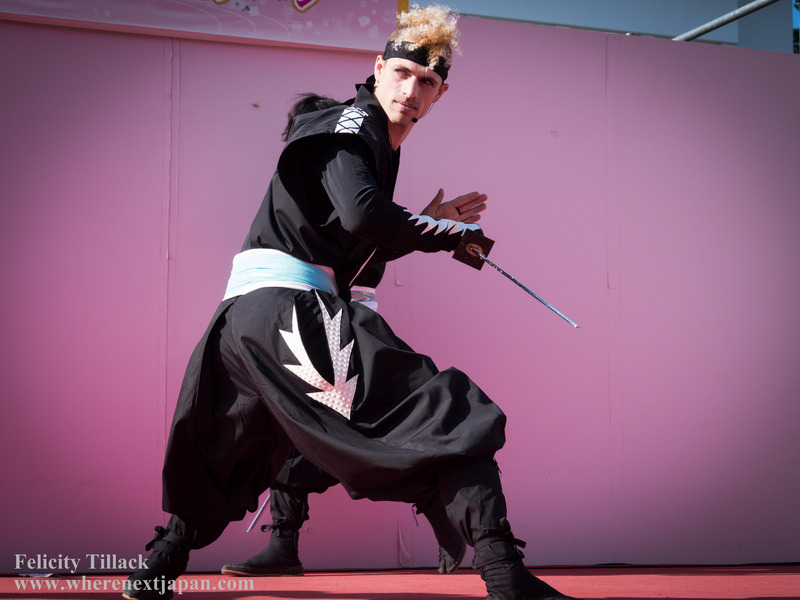 I went to Nagoya to find the answers to three questions: What does it take to become a modern day ninja? What kind of people were chosen to take the position? Was their debut a success? Chris Oneill, first non-Japanese ninja. I found a group of dedicated, young people, training even after their scheduled hours, and even on their rest day; I found language barriers and frustrations; I found different cultural ideas of the concept of a ninja; and a level of professionalism that demanded they become as close to the real thing, the real idea of a Japanese ninja, as possible in 2016. I look forward to showing more of the behind the scenes, and part of the journey that the new Hattori Hanzo ninja squad took in the days before their debut in a video soon coming out. They continue to perform daily at Nagoya castle, so if you’re in Japan, go see them in action! Otherwise, join the conversation: what do you think it takes to be a ninja? The dangers inherent to hard training for weeks. Hiromi M practicing with the sound effects. Scenes from training in the final days before their public debut. Spirits were high as they finally went out before the public. Speed and acrobatics are part of being a ninja, but not all of it. The man who plays Lord Tokugawa is a pro, and has been in the role 7 years. He expects a lot from his ninja team, beyond their skills as performers. So, do you want to be a ninja?